Mattis told reporters aboard an Air Force E-4B jet, a militarized Boeing 747, en route to northern Alaska that he plans to gauge China's strategic approach to the United States during talks in Beijing. "On our relations with China, obviously we're reviewing our military-to-military relationship [to] make sure it's aligned within our larger strategic framework," Mattis said. The defense secretary described the upcoming meetings in China, which will include talks with senior generals, as an exchange on "strategic perspectives" on topics of mutual concern to "determine where we have common interest and where our interests diverge." The Pentagon for the first time in decades identified China, along with Russia, as a strategic military threat under a new national defense strategy made public in January. The strategy labeled China a strategic competitor, reflecting the new White House national security strategy that has focused on economic and trade threats posed by Beijing's unfair policies. China for years has rebuffed repeated U.S. attempts to build trust through military exchanges of senior officers, which critics say have often been exploited by the People's Liberation Army in a bid to gain intelligence on American military strengths and weaknesses that could be used against U.S. forces in a future conflict. Mattis declined to say whether the review of military exchanges would lead to scaled back visits by senior military officials from both countries. The defense secretary left Sunday from Joint Base Andrews on a six-day visit to Asia that includes stops in Alaska, China, South Korea, and Japan. The visit to China comes amid U.S. complaints at China's recent deployment of advanced antiship missiles and air-defense missiles on disputed islands in the South China Sea. The missile emplacements violated a September 2015 pledge by Xi, announced during a summit with then-President Barack Obama, that China would not militarize the disputed islands. The islands also are claimed by the Philippines, Vietnam, and several other states in the region. China has built up some 3,200 acres of new islands in the sea over the past several years and quietly added military facilities, including runways, bunkers, storage areas, and recently missiles. As a result of the missile deployments, the Pentagon blocked China from sending navy ships to take part in the upcoming U.S.-led international naval exercise called Rim of the Pacific, or RIMPAC. Mattis is scheduled to arrive in China as naval forces from more than two dozen nations kick off the exercises later this week. The timing of the Mattis visit coinciding with the start of RIMPAC will likely be viewed by the Chinese as further highlighting the snub of the PLA Navy. "The idea is to maintain transparency, to maintain understanding what each other is doing," Mattis said of RIMPAC. "Navies can be one of the most stabilizing influences in terms of counter piracy, freedom of navigation, disaster relief, humanitarian support." Several recent U.S. warship passages in the South China Sea were met with Chinese warships that tried to force the Navy vessels out of the region. China also upset the U.S. military recently by firing a laser at U.S. military aircraft flying near a Chinese military base in Djibouti, on the Horn of Africa. The laser injured the eyes of two aircrew members aboard C-130 transport aircraft flying to a nearby U.S. base. China in recent months also has stepped up military coercion of Taiwan, an American ally, by flying bombers near the island, which is located 100 miles off the Chinese southern coast. Mattis's first visit to China comes after he criticized China's activities in the region during a speech last month in Singapore. "I think the way to address issues between our two nations is to first establish a transparent, strategic dialogue," he said. Mattis said he plans to study how the Chinese view the current state of relations with the United States and how they are developing. He also plans to explain to Beijing's leaders how the United States views the relationship. "And the way to get to the other issues that are vexing is to start with strategic transparency as a way to get to operational transparency," he said. "So that would be my message," Mattis said, without elaborating further. China under current supreme leader Xi has initiated a major purge within the military over corruption. Analysts, however, say the ousting of scores of senior military members is more likely the result of Xi's bid to consolidate power by removing potential rivals for power. Xi, in addition to being party leader, also heads the Central Military Commission, the ultimate power organ within the ruling Communist Party of China system. Mattis declined to characterize U.S.-China tensions over the South China Sea, Taiwan, and Beijing's theft of American technology as the harbinger of a new Cold War. "We have larger issues and you see those being handled," Mattis said. Trade negotiations are currently underway involving the State Department and Chinese Foreign Ministry. "And again I'm going there to get what I consider to be straight from them what they see for a strategic relationship," he said. The retired Marine Corps general added that he plans to "go in right now without basically poisoning the well at this point as if my mind is already made up. I'm going there to have a conversation." Asked if he planned to scale back military engagement with China, Mattis declined to say what he would or would not do in the future. "I would tell you that going forward that we obviously look at the actions of China, but I'm going there to do a lot of listening and identification of common ground and uncommon ground on the strategic level," he said. Mattis said he believes China shares the U.S. interest of seeking a denuclearized Korean Peninsula. "That's they're policy," he said. "But by and large I want to go in and take a measure for where they're at today and see where our interests converge." "At the same time I'm going in to do the listening this time and make certain that where we can, we can engage in a transparent strategic conversation." Asked about the new defense strategy's identification of China as a strategic competitor, Mattis said, "that's why I'm going there." "I want to understand how they see the strategic relationship developing, and first of all hear in their words how they see this going strategically. I do not want to immediately go in with a certain preset expectation of what they are going to say. I want to go in and do a lot of listening." As for the issues of U.S. concerns, "I'll be very clear on what we see developing," Mattis said. "But that's the whole reason I'm making the trip, instead of just sitting in Washington and reading news reports, intelligence reports, or analysts' reports." During the wide-ranging interview with reporters, Mattis said the Pentagon is preparing two military bases in the United States to house illegal immigrants held in detention. The bases are part of logistics support to the Department of Homeland Security that is grappling with the politically charged issue of illegal immigrant children held in detention centers. 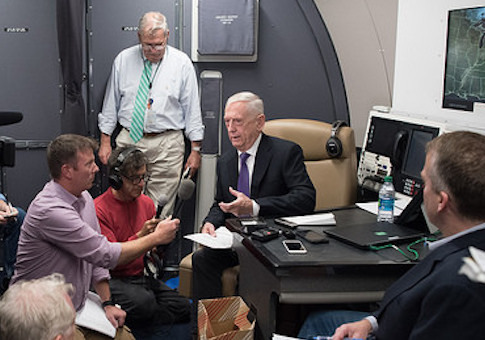 Mattis said the military support will be similar to American military support to fleeing Vietnamese boat people after the communist takeover of South Vietnam in the 1970s and U.S. military support to Americans displaced in the aftermath of natural disasters. Mattis also defended the decision to suspend U.S.-South Korean military exercises that came out of the summit between President Trump and North Korean leader Kim Jong Un. A large-scale joint exercise set for August has been suspended but could be put back on if progress in the nuclear talks with North Korea stalls. "We anticipate that progress will be made, and as it was decided in Singapore, the large joint combined exercises have been suspended," Mattis said. "I would just say we see if the continuing negotiations keep them that way. But right now they've been suspended.… I don't have a crystal ball. No one knows. It's up to the diplomats to make sure this goes OK."
Mattis said he remains in close communication with Secretary of State Mike Pompeo, who is expected to visit North Korea soon for follow-on nuclear talks. Mattis on Monday plans to visit Fort Greely, Alaska, the location of American ground-based interceptors—part of the antimissile system that would be used to counter any North Korean missile attack. Currently, 40 ground-based interceptors are deployed and more are being added. Mattis also said the United Nations Command in South Korea is prepared for North Korea to turn over remains of soldiers killed during the Korean War from 1950 to 1953. North Korean agreement to return the remains, which may include casualties from nations other than the United States and South Korea, was one of the outcomes of the recent Singapore summit. The U.N. command has "staged appropriate logistics materials and we are simply standing by for whenever the diplomatic activities are done and this begins," Mattis said. "We're optimistic it will be done because that was an agreement coming out of Singapore." This entry was posted in National Security and tagged China, DHS, Illegal Immigration, James Mattis, Japan, Pentagon, South Korea. Bookmark the permalink.